On April 2, 2019, Intel brought media, analysts and influencers from around the world to share their vision for the future of Data Centric Innovation. Below we explore their key announcements and provide Futurum Research’s analyst perspective on the various announcements and the impact they will have for enterprises and hyperscalers as they seek to scale their businesses in the age of rapid data and compute proliferation. Analyst Take: A few things really stood out to me around the 2nd Gen Intel Xeon Scalable. First is the Deep Learning Boost (DL-Boost) technology that allows speeds of up to 30x (With the Xeon 9200) for AI Inference workloads like image recognition. The second thing that caught my attention is the ability to utilize Optane Persistent memory to move more storage into memory, which speeds up the ability to extract insights from data and increases capacity. This memory technology also enables greater security by offering full end-to-end encryption of data in flight; something I think is often ignored, but critical as new network topology from edge to core continues to proliferate the way data is utilized. New features built into the 2nd-Generation Intel Xeon Scalable processors include integrated Intel® Deep Learning Boost (Intel® DL Boost) for AI deep learning inferencing acceleration and support for Intel® Optane® DC persistent memory, the revolutionary technology that brings affordable, high-capacity persistent memory to Intel’s data centric compute portfolio. Analyst Take: I mention above that these two capabilities were definitely standout performers in my mind. Intel, has intelligently differentiated themselves by upping the ante on machine learning performance by developing leading inference capabilities with Deep Learning boost. Different than typical training, inference makes connections with the data to be able to recognize, detect and segment information. DL Boost enables this to happen faster so larger data sets can be analyzed and improved insights can be realized. Intel’s DL Boost, for free in 2nd Gen Xeon, appears to stave off NVIDIA’s discrete controllers from a performance per watt basis on latency-dependent ML workloads. Optane Persistent Memory is also a unique differentiator and I believe Intel knows this. The Modules run only on Xeon Scalable so unlike traditional DRAM, you it is part of the ecosystem and you cannot benefit from what Intel is doing with increased in memory capacity unless you are running Xeon Scalable. Analyst Take: I believe these Agilex line will be important for the rapid proliferation of Edge and 5G applications requiring customization. With only Xilinx providing real competition in the high end FPGA space for Intel right now, Intel appears to be better positioned to partner with CSP and CoSP building specialized applications at the edge with their Agilex offering. 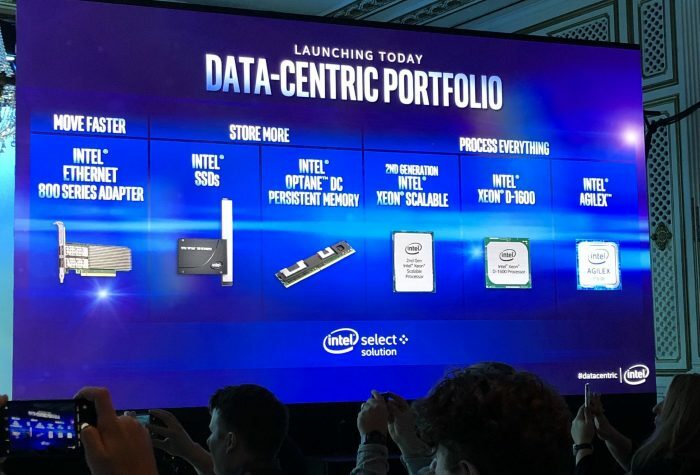 Overall Impressions: Intel’s deep commitment to the rapid evolution of the data center rang through in their announcements today. I believe what separates them from their competitors, especially AMD is their attention to building a complete ecosystem that is required for enterprises and hyperscalers to develop data centers that aren’t only supporting today’s needs, but that truly scale to meet what is coming next. While Intel certainly sits in the premium price category, companies considering building their data center strategy would be remiss not to consider the ecosystem of OEM’s and ISV’s that are enabling a wide array of possibilities for companies looking to maximize workforce productivity through the power of compute. From 5G and Edge Computing to AI Inference to custom ASICS, Intel continues to position itself as a must consider for data center investments.